BACKGROUND Osteoarthritis (OA) is the most common joint disease encountered throughout Europe. A task force for the EULAR Standing Committee for Clinical Trials met in 1998 to determine the methodological and logistical approach required for the development of evidence based guidelines for treatment of knee OA. The guidelines were restricted to cover all currently available treatments for knee OA diagnosed either clinically and/or radiographically affecting any compartment of the knee. METHODS The first stage was the selection of treatment modalities to be considered. The second stage comprised a search of the electronic databases Medline and Embase using a combination of subject headings and keywords. All European language publications in the form of systematic reviews, meta-analyses, randomised controlled trials, controlled trials, and observational studies were included. During stage three all the relevant studies were quality scored. The summary statistics for validated outcome measures, when available, were recorded and, where practical, the numbers needed to treat and the effect size for each treatment were calculated. In the fourth stage key clinical propositions were determined by expert consensus employing a Delphi approach. The final stage ranked these propositions according to the available evidence. A second set of propositions relating to a future research agenda was determined by expert consensus using a Delphi approach. RESULTS Over 2400 English language publications and 400 non-English language publications were identified. Seven hundred and forty four studies presented outcome data of the effects of specific treatments on knee OA. Quantitative analysis of treatment effect was possible in only 61 studies. Recommendations for the management of knee OA based on currently available data and expert opinion are presented. Proposals for a future research agenda are highlighted. CONCLUSIONS These are the first clinical guidelines on knee OA to combine an evidence based approach and a consensus approach across a wide range of treatment modalities. It is apparent that certain clinical propositions are supported by substantial research based evidence, while others are not. There is thus an urgent need for future well designed trials to consider key clinical questions. Osteoarthritis (OA) is by far the most common disease to affect synovial joints. It is a major cause of musculoskeletal pain, the single most important cause of disability and handicap from arthritis, and an important community healthcare burden. OA is strongly associated with aging and, with the increasing proportion of elderly in Western populations, large joint OA, particularly of the knee, will become an even more important healthcare challenge. Multiple genetic, constitutional, and environmental factors may contribute to the development and variable outcome of OA. OA of the knees is particularly common, with radiographic OA of the tibiofemoral compartment occurring in 5–15% of people aged 35–74 years. The condition is often associated with pain and disability and symptomatic subjects often seek medical advice. Treatment aims at (a) educating the patient about OA, (b) alleviating pain, (c) optimising and maintaining function, and (d) preventing or retarding progression of adverse structural change affecting the joint tissues (cartilage, bone, ligament, muscle). Current treatments include a wide range of non-pharmacological, pharmacological, and surgical modalities. Evidence to support the effectiveness of individual treatments, however, is variable. Clinical guidelines were defined in 1995 by the Institute of Medicine in Washington as “Systematically developed statements to assist practitioner and patient decisions about appropriate health care for specific clinical conditions.” Using these principles, guidelines on the management of knee OA have been published by the American College for Rheumatology1 and the Royal College of Physicians.2 However, such guidelines primarily represent consensus statements from expert panels. The type and strength of evidence to support such guidelines remain unclear. In 1998 EULAR commissioned a steering committee to review the available research evidence for treatments of knee OA, to develop guidelines relating to clinical issues in OA management, and to indicate clearly the level of evidence to support individual statements. It was felt that the development of such evidence based guidelines for the management of knee OA might lead to improvements in patient care and to more uniform treatment approaches throughout Europe. The initiative endorsed by ESCISIT involved a committee of 21 experts in the field of osteoarthritis (18 rheumatologists, three orthopaedic surgeons) representing 12 different European countries, together with two experts in the field of guidelines methodology. The objectives of the committee were (a) to describe the treatments available for the treatment of knee OA and to review the current level of evidence for their effectiveness and (b) to produce recommendations for the management of knee OA based on a combination of current evidence based and expert opinion. During the first meeting the committee produced a comprehensive list of treatment modalities to be included in the review process (table 1). To focus the review process towards clinically relevant issues, the committee also agreed 10 clinically important questions related to the management of OA of the knee. A systematic search was devised and conducted using two databases, Medline Ovid and BIDS Embase. The search strategy was designed to be inclusive. All European language publications in the form of systematic reviews, meta-analyses, randomised controlled trials, controlled trials, and observational studies were included. Publications in non-European languages were excluded. Several search headings were “exploded”, including osteoarthritis, randomised controlled trial, meta-analysis, and management. The reference studies discovered in review papers and meta-analyses were also included. The searches were conducted for the period January 1966 to December 1998 and were last performed in July 1999. All trials that assessed the effects of one of the specified treatments on OA of the knee were selected. For the purpose of this review OA of the knee was defined as patients with clinical and/or radiographic evidence of knee OA. Only papers exclusively studying knee OA were included in the quantitative analysis; those studying OA in more than one joint (for example, hip plus knee OA) were excluded after qualitative assessment. The methodological design of each study was scored according to a predetermined system.3 This methodological checklist provided a quality assessment of the reporting, external and internal validity, and the statistical power of each study. Studies were scored 0–1 for 26 questions and 0–2 for one question, giving a maximum score of 28. Power calculations were scored as 1 if present and 0 if absent. English language publications were scored by three assessors. Other European language publications were assessed by individual members of the EULAR Steering Committee fluent in the language of the publication. All quality assessments were collected and recorded centrally. Quantitative analysis of treatment effect was assessed, where possible, by calculating the effect size (ES)4 and/or the number needed to treat (NNT)5 for validated outcome measures of pain and physical function. Before the calculation of these quantitative measures all studies were assessed for the availability of adequate summary statistics. The mean and distribution of values for the baseline, end point, and difference from baseline to end point were tabulated for each of the outcome measures recorded. The Z and T scores and p values were also recorded when available. Effect size calculations were performed with meta-analysis software.6Pooled variance of baseline values was used as an estimation of the pooled variance of the difference between baseline and end point. The NNT was estimated for 20% reduction in pain outcome measures from baseline. This calculation was performed on continuous data (visual analogue scale (VAS)) using an assumption that the values for change displayed a normal distribution about the mean. In the absence of data allowing direct quantification of the treatment effect, studies were simply classified as to the presence or absence of a statistically significant improvement in outcome. Evidence was categorised according to study design reflecting susceptibility to bias. Table 2 shows the categories in descending order of importance. Categories of evidence were adapted from the classification of the United States Agency for Health Care Policy and Research. Questions were answered using the best evidence available. If, for example, a question on the effect of intervention could be answered by category 1 evidence, then studies of a weaker design (controlled trials without randomisation) were not reviewed. The strength of recommendation for an intervention was graded A-D (table 3) by the four members of the editing subcommittee of the task force, after examination of the evidence in detail. The strength of recommendations is based not only on the level of evidence but also on consideration of the following: the effect size of the intervention; the side effect profile, the applicability of the evidence to the population of interest, the practicality of delivery; and economic considerations. After informing the experts about the results of the literature research and the meetings that discussed the main advantages and disadvantages of the different treatment modalities, a questionnaire was sent to all experts asking for their overall personal recommendation for each intervention. This was expressed by a VAS, in which 0 represented the statement “I do not recommend this treatment modality” and 100 represented the statement “I fully recommend this treatment modality”. Results are presented as the mean and standard deviation of the scores. Two sets of recommendations were elaborated: (a) the final expert recommendations on treatment, and (b) recommendations for a research agenda. The experts decided arbitrarily to provide 10 short sentences summarising their opinions for each list. A Delphi approach was then employed to reach a consensus. All the recommendations were collated (121 for the final treatment propositions and 110 for the research agenda) and then sent back to the experts with the request to rank the most important 10 propositions to be included in the final set of recommendations. For the second round of the Delphi exercise, only those recommendations which received approval from at least five experts were retained (25 for the final treatment propositions and 24 for the research agenda). The same approach was used for the third round (17 propositions for treatment recommendations and 18 for the research agenda propositions), resulting in eventual determination of the most agreed 10 short sentences in each set. The researchers who undertook the literature research evaluated the level of evidence of each of the 10 final propositions of the experts. Two thousand eight hundred and ninety two studies were identified by the search strategy, 744 were intervention trials involving knee OA. Six hundred and eighty of these trials used at least one of the 23 treatment modalities outlined in table 1. Three hundred and sixty five trials assessed a non-steroidal anti-inflammatory drug (NSAID) as the primary intervention. Table 4 summarises the quality assessment score (QS) and the calculation of the ES for pain reduction for each intervention. From the 680 studies, 61 (31 placebo controlled) provided adequate summary statistics for knee OA to enable the ES for pain reduction to be estimated. Of the 61 studies, 11 provided enough data to allow the calculation of the true ES. A calculation of ES for functional improvement under Lequesne's index was performed on seven studies and is summarised in table5. Only five studies on knee OA alone provided sufficient data to calculate the number needed to treat to gain a 20% reduction in pain (NNT20). Two studies involved topical interventions, one used capsaicin gel7 (QS 21) NNT20 5.5 and one used diclofenac gel8 (QS 22) NNT20 6.8. Two studies involved intra-articular hyaluronic acid, but the trial period varied considerably between the studies. In one study9 (QS 22) outcome measures were recorded over 343 days, NNT2040.2, whereas in another study10 (QS 25) over 35 days the NNT20 was 7.2. Only one NSAID study, on oral diflunisal11 (QS 16), suggested that 5.9 patients need to be treated to gain a 20% reduction in pain over a 42 day period. Of the 23 modalities, 16 were supported by evidence from at least one randomised controlled trial and were graded as either 1A or 1B for category of evidence. From surgical studies only those concerned with arthroscopic debridement and patellar replacement were supported by evidence from randomised controlled trials. Osteotomy and total joint replacement were only supported by category 3 evidence. Only seven of the 16 modalities supported by grade 1 evidence received an “A” for strength of recommendations from the panel of experts (table 4). Figure 2 summarises the overall opinion of the experts of the usefulness of each treatment modality. The experts gave similar weighting to oral drugs such as paracetamol and NSAIDs, intra-articular treatments such as steroids, non-pharmacological treatments such as patient education and exercise, and surgical treatment such as joint replacement. Tables 6 and 7 summarise the final treatment recommendations and the research agenda. These propositions are in no ranked order. This statement represents ideal practice and the decision-making that is required in clinical practice. Clinical trials predominantly investigate the efficacy of one or two specific single treatments in highly selected homogeneous groups of otherwise fit subjects with knee OA. Derived data are therefore not directly applicable to the whole population of subjects with OA. Furthermore, few studies have examined the predictors of response to treatment required to produce the evidence base to allow such decisions to be made. As well as the expected relative benefits and potential dangers of the interventions themselves, other aspects specific to the patient must clearly be taken into account. This has relevance to both medical and surgical interventions. The holistic approach to the patient is universally accepted. It has obvious face validity but no research based justification specific to knee OA. There is indirect evidence that non-pharmacological modalities offer additional benefit over and above analgesic use from randomised controlled trials in which all subjects were receiving analgesics at baseline. These have shown that a home exercise programme14 (QS 13), physiotherapy15 (QS 19), and education16 17 (QS 12, 17) offer additional benefit when used in addition to an analgesic regimen. There is therefore a reasonable evidence base to support this statement (1B). Paracetamol is commonly used as self medication for the treatment of mild to moderate pain. It is the recommended initial oral analgesic for knee OA in published guidelines.1 2 However, few studies have directly assessed the efficacy of paracetamol in knee OA. One six week randomised controlled trial in just 25 patients18 (QS 21) showed a significant improvement in pain at rest from paracetamol compared with placebo. Two studies comparing paracetamol with an oral NSAID in knee OA recorded within-group reduction in pain with paracetamol.19 20 One four week randomised controlled trial showed that paracetamol 4 g/day was as effective as ibuprofen (up to 2400 mg/day)19 (QS 21). Another randomised controlled trial showed that paracetamol can be used effectively in doses of up to 2400 mg over 2 years without significant adverse outcomes20 (QS 23). There are no drug interactions or common contraindications to the use of paracetamol, including its use in the elderly. In summary, there is evidence (1B) that paracetamol is effective in the treatment of knee OA and that in many patients it is comparable with ibuprofen in the short term. There is also evidence (1B) that paracetamol may be taken safely over the long term. Clearly, a drug that is both safe and commonly effective should be considered early in the management of knee OA and, if effective, as an integral component of long term pain control. With the increasing focus on the low grade inflammatory component of OA, NSAIDs would appear to be logical drugs in patients unresponsive to paracetamol, particularly in the presence of clinically overt synovitis. There is, however, no direct evidence base to support this statement. Numerous studies have shown that oral NSAIDs are better than placebo (ES median 0.49, range 0.16–1.19), confirming the efficacy of NSAIDs in the management of knee OA. Topical NSAIDs are a useful option in those unwilling or unable to take oral NSAIDs. A randomised controlled trial of topical diclofenac including 155 patients8 (QS 22) recorded a positive ES of 0.91 compared with placebo. Another study with eltenac involving 281 patients21 (QS 26) recorded a negative ES −0.05, but suggested benefit in those with severe disease. There is good evidence (1B) for the efficacy of NSAIDs, both oral and topical, in the management of knee OA. There is good evidence that they are more efficacious than paracetamol but the statement that they should be used in patients in whom paracetamol has failed, though attractive, does not have an evidence base to support it. The effects of steroids in knee OA have been assessed in a number of studies. One randomised controlled trial concluded that steroid was more effective than placebo for pain relief over seven days (ES 1.27) in patients with knee OA, not all of whom had effusions22(QS 19). Another randomised controlled trial involving 98 patients showed a significant difference between intra-articular steroid and placebo after one week but no difference after 24 weeks, supporting only relatively short term benefit from this treatment12(QS 18). Few studies have assessed predictors of response. One randomised controlled trial involving 84 patients confirmed short term improvement of symptoms for steroid over placebo and found a better outcome in those with an effusion23 (QS 22). However, a randomised crossover study of methylprednisolonev saline found no clinical predictors of response, suggesting that steroid injection should not be reserved just for those with effusion24 (QS 17). In conclusion, there is evidence (1B) that intra-articular steroids are efficacious but their benefit may be relatively short lived. The evidence for predictors of response, however, remains unclear, and further studies are needed to consider this question. 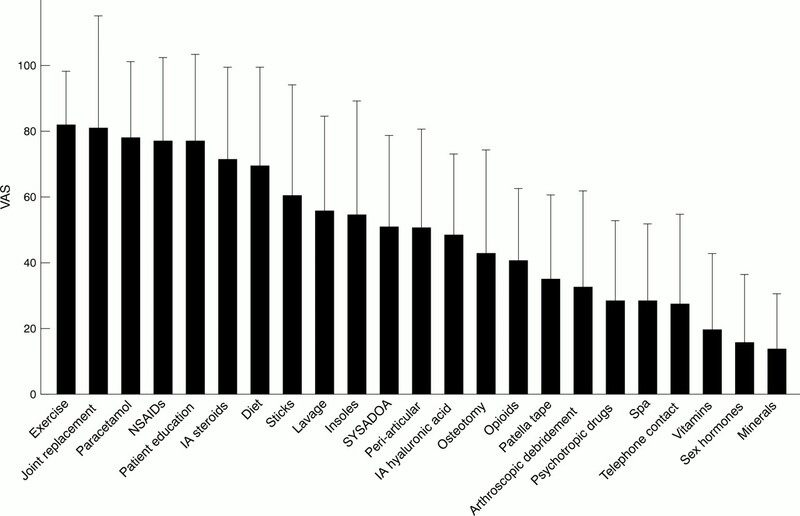 Promising data exist from animal models of OA, but there are few clinical trials in humans. A 12 month randomised controlled trial of 39 patients with knee OA showed that intra-articular hyaluronan delayed the structural progression of OA as assessed by arthroscopic assessment of articular cartilage.25 More studies using standardised methodology are required before we can propose a disease modifying role for these compounds. The introduction of hyaluronic acid has been viewed as an advance in the management of OA. Its role in pain reduction, functional improvement, and disease modification in knee OA has been assessed. Until 1998, 32 trials assessed the efficacy of hyaluronic acid in relation to the knee joint. Three randomised controlled trials that allowed calculation of effect size recorded significant reductions in pain against placebo (ES 0.04, 0.49, 0.9) over time periods of 60 days to one year9 26 27 (QS 22, 19, 14). One study recorded functional improvements on Lequesne's index (ES 0.36) over one year.9 One study looked at endoscopic changes over the short term and showed a decrease in disease progression over one year.25 However, no studies considered possible predictors of response, and no studies until the end of 1998 provided evidence for a role in disease modification in the long term. The use of SYSADOA in the management of knee OA varies widely across Europe. Such variations in practice depend on a number of factors, from local availability of the product to the lack of guidelines to a doctor's personal choice. On reviewing the literature 59 studies were identified involving SYSADOA in knee OA. The products were assessed individually. For chondroitin sulphate, three randomised controlled trials recorded a significant improvement in knee pain over placebo (ES 1.23, 1.5, 1.37)28-30 (QS 24, 25, 21), two of which recorded similar improvements in function (ES 1.01, 1.32).29 30 Such improvements were also recorded in a six month randomised controlled trial, following direct comparison with diclofenac (ES 1.44)31 (QS 20). Three studies involved glucosamine sulphate. Compared with placebo, glucosamine appears to be effective for both pain reduction (ES 1.02) as recorded in one controlled study over eight weeks32 (QS 14) and for functional improvement as recorded in one randomised controlled trial33 (QS 26). When compared directly with an NSAID (ibuprofen) the effect on pain was comparable over four weeks34 (QS 23). Twenty nine studies assessed the efficacy of glycosaminoglycan polysulphuric acid (GAGPS), though many were of poor quality and few focused on knee OA alone. Two randomised controlled trials recorded improvements in knee pain when compared with placebo (ES 1.18, 0.28)35 36 (QS 18, 21). One of these studies also recorded improvements in function (ES 0.11) over six months.36 However, GAGPS (Arteparon) is currently unavailable in Europe. In summary, there is evidence to support the efficacy of hyaluronic acid in the management of knee OA both for pain reduction (1B) and functional improvement (1B). However, although pain relief may be obtained for several months, rather than for several weeks as with steroid, this benefit may be offset by its slower onset of action and by the requirement of a course of three to five injections a week with the logistical and cost issues that entails. There is no evidence for a role in disease modification. The term SYSADOA covers a range of agents and although, again, there is some evidence to support the use of two of these agents, glucosamine sulphate (1B) and chondroitin sulphate (1B), the evidence for others is weak or absent. Education should form an integral part in the management of any chronic disease. Practitioners should always explain to the patient the nature of their condition, its prognosis, the requirement of investigations and what that involves, and determine with the patient the rationale and practicalities of their individualised management plan. However, in addition to professional responsibility, education itself may have an impact on the outcome of disease. Several large randomised controlled trials and a meta-analysis have shown benefits of different educational techniques in reducing pain and increasing coping skills, but with little impact on function in patients with knee OA.37 Education techniques shown to be effective include individualised education packages16 (QS 12), regular telephone calls17 (QS 17), patient coping skills,38 39 (QS 15, 13) and spouse-assisted coping skills training40 (QS 15). No randomised controlled trials have considered the use of insoles or walking sticks in the management of knee OA. Two controlled studies of insoles13 42 (QS 11, 10), however, both showed an improvement over the control. Although weight reduction is recommended to virtually all patients with knee OA, the relation between weight reduction and knee OA has only been assessed formally in two studies. A randomised placebo controlled trial on the use of phentermine in generalised OA43 (QS 13) showed an improvement in pain compared with baseline but not compared with placebo. A large cohort study44 (QS 15) showed that weight loss reduced the risk of developing symptomatic knee OA in women. There is therefore good evidence that education (1A) and exercise regimens (1B) reduce pain in knee OA and that exercise regimens also improve function. The use of appliances and advising weight reduction both seem sensible options in patients with knee OA, but are only supported by relatively weak evidence at present. Referral to a physiotherapist is one of the mainstays of treatment for patients with knee OA. The efficacy of quadriceps strengthening exercises in patients with knee OA has been examined in nine studies. All studies recorded improvements in pain when compared with baseline values. Four randomised controlled trials14 15 45 46(QS 19, 14, 13, 18) were identified including a total of 531 patients. All trials recorded significant improvements in pain when compared with the control groups (ES 1.05).45 Two of the studies14 15 also showed a significant improvement in functional index compared with the control group. Such exercise need not necessarily require regular professional supervision.14 Interestingly, when strengthening exercise was directly compared with aerobic fitness training for knee OA15 both seemed equally efficacious over 18 months. Many regimens combine elements of both forms of exercise, though whether the effects of both are additive remains uncertain. There is therefore good evidence (1B) that quadriceps strengthening exercises are beneficial in the management of knee OA. There is also evidence, however, that fitness training has long term benefits for pain and function from knee OA. There is strong clinical agreement that patients severely incapacitated by OA can have their lives transformed by knee replacement surgery. Difficulty arises when an attempt is made to assess the strength of evidence for a given surgical approach or an attempt made to compare this approach with other treatment modalities. Of 51 studies identified in this area, no studies compared surgery with non-surgical management. Twenty eight studies focused on total knee replacement, 17 on unicompartmental knee replacement, while six focused on patellofemoral joint resurfacing or replacement. All studies reported improvements in pain and/or function compared with baseline parameters. Although it is acknowledged that difficulties with study design may limit randomised studies on surgical treatments, there are areas which should be explored, including predictors of response, differences in surgical technique, or joint prosthesis on long term outcomes. The influence on long term outcome of knee replacement, expressed in terms of “implant survival”, of various factors (patient, procedure, implant, and surgeon related) have been examined using the Swedish nationwide knee replacement registries.47 Although a strength of these studies is their power (based on large numbers), generalisability, and long term follow up, a limitation is created by their use until recently of implant revision only as the outcome measure. The relation between implant revision and patient satisfaction or other outcomes relevant to the patient is uncertain. These are the first clinical guidelines on knee OA to be developed by EULAR. As defined by the Institute of Medicine clinical guidelines are “Systematically developed statements to assist practitioner and patient decisions about appropriate health care for specific clinical conditions”.48 An evidence based approach was specifically chosen by the task force to minimise the potential limitations of “expert opinion” alone49 and to permit, wherever possible, calculation of effect sizes and NNT to allow comparison of efficacy between diverse forms of treatment. Importantly, the type of evidence to substantiate the statements made (ranging from robust research evidence to expert opinion alone) is explicitly stated. Despite the strengths of this method of guideline development a number of caveats deserve emphasis. Although we employed a traditional search strategy, used two recognised large computerised databases, and extended the search to include non-English languages represented on the task force, some study data might have been excluded from our review. Furthermore, our interest was restricted to the knee and we did not include studies for the calculation of effect size or NNT having mixed patient groups with OA where summary statistics were not available for the knee alone. Importantly, we had to set a finite end date for the search (December 1998) and restricted our deliberations to the evidence that arose from that search. We recognise, of course, that other studies have been reported during the interval to publication and that the guidelines will require regular update and review in the light of new evidence and evolving methods of healthcare delivery. A further issue is the comparability and quality of the research evidence. Different studies varied greatly in their design—for example in the type of patient with OA studied, the availability of concomitant analgesic drugs, the outcome measures used, and the duration of treatment, all of which hamper determination of comparative efficacy. Furthermore, the quality of the studies varied. We used a recognised quality assessment measure that is suited for a variety of study designs.3 “Quality” scores, however, assess not only the design and rigour of a study but also the presentation of the information.50 We therefore did not exclude studies purely because of low total scores. However, it was noteworthy that the scores obtained were not high and that few studies provided sufficient information to calculate effect size or NNT. Interestingly, there was little difference in quality scores between the different treatment modalities, the lowest mean scores occurring in non-pharmacological studies with their inherently greater difficulties of blinding and randomised controlled trial design. It was of interest that there was often discordance between the research evidence and the opinion of the experts. It would seem that much of our practice is governed more by our clinical experience, local situation, and individual bias than the balance of published evidence. This was even the more striking with such broad representation from across Europe. Varying attitudes towards the nature of knee OA in the countries represented, varying access to health professionals, different healthcare delivery systems, and different methods of funding all probably contributed to discrepancies between experts in their weighting of individual treatment strategies. Nevertheless, despite such differences the Delphi system permitted consensus agreement on the issues presented. It is apparent that there are important areas of clinical practice for which there is no clear evidence based research. There was a general paucity of well designed randomised controlled trials to consider the clinical questions raised. In particular, few studies examined long term treatment outcome (12 months or longer), even though knee OA is associated with chronic or intermittent symptoms that spread over many years. Also, few studies sought clinical predictors of treatment response, such as x ray severity, presence of clinical inflammation, age, or obesity. Unfortunately, restricting patient entry to ensure homogeneity for clinical variables excludes determination of such predictors and greatly limits the generalisability of the study findings.51 There are therefore few data to guide treatment choice for long term management of heterogeneous patients with “knee OA”. An important function of these guidelines has been to emphasise such gaps in our knowledge and to help inform the future research agenda on clinically relevant issues. The task force made no attempt to produce stepwise algorithms or to give dogmatic directives for treatment strategies. Any management plan needs to be individualised to take into account holistic factors, such as patient attitudes and knowledge, constitutional features (for example, obesity, muscle weakness, non-restorative sleep), risk factors for OA progression, degree of structural damage, comorbid disease and treatment, treatment availability, and costs. Management also includes several concurrent elements given as a package rather than as sequential single treatments. The task force therefore focused on specific clinical questions and determined, wherever possible, comparative effect sizes for different treatment options. Our findings are in general accord with other published guidelines but present more clearly the evidence on which any statements are based. The content and conclusions of this document now need to be considered and discussed as widely as possible by healthcare professionals participating in the management of subjects with knee OA. The views of patients will also be sought. EULAR has undertaken to commission regular review of the guidelines to take into account the perspectives of all interested parties, new research evidence, and changes in healthcare delivery. The task force would welcome discussion of this important clinical topic. Contact is invited with any member of the task force. The authors thank UPSA representatives (Manuela Le Bars and Eric Boccard) for their contributions and UPSA for financial support to meeting costs. (1995) Guidelines for the medical management of osteoarthritis. Part II. Osteoarthritis of the knee. American College of Rheumatology [see comments]. Arthritis Rheum 38:1541–1546, . (1993) Guidelines for the diagnosis, investigation and management of osteoarthritis of the hip and knee. Report of a Joint Working Group of the British Society for Rheumatology and the Research Unit of the Royal College of Physicians. J R Coll Physicians Lond 27:391–396, . (1998) The feasibility of creating a checklist for the assessment of the methodological quality both of randomized and non-randomized studies of health care interventions. J Epidemiol Community Health 52:377–384, . (1977) Statistical power analysis for the behavioural sciences. (Academic Press, New York) . (1988) An assessment of clinically useful measures of the consequences of treatment. N Engl J Med 318:1728–1733, . (2000) Meta-Analysis Programs version 5.0. (Ralf Schwarzer Computer Programs fo Meta-Analysis, Berlin, Germany), www.fu-berlin.de/gesund/meta_e.htm. (1991) Treatment of arthritis with topical capsaicin: a double-blind trial. Clin Ther 13:383–395, . (1993) DHEP plasters as a topical treatment of knee osteoarthritis: a double-blind placebo-controlled study. Drugs Exp Clin Res 19:117–123, . (1993) High molecular weight sodium hyaluronate (hyalectin) in osteoarthritis of the knee: a 1 year placebo-controlled trial. Osteoarthritis Cartilage 1:97–103, . (1995) Hyaluronic acid in the treatment of osteoarthritis of the knee joint: interim results of a comparative clinical study. Eur J Rheumatol Inflamm 15:39–45, . (1985) The efficacy of diflunisal in osteoarthritis of the knee. A Canadian Multicenter Study. J Rheumatol 12:544–548, . (1999) Effects of joint lavage and steroid injection in patients with osteoarthritis of the knee: results of a multicenter, randomized, controlled trial. Arthritis Rheum 42:475–482, . Sasaki T, Yasuda K. Clinical evaluation of the treatment of osteoarthritic knees using a newly designed wedged insole. Clin Orthop Relat Res 1987:181–7..
(1999) Effectiveness of home exercise on pain and disability from osteoarthritis of the knee: a randomised controlled trial. Ann Rheum Dis 58:15–19, . (1997) A randomized trial comparing aerobic exercise and resistance exercise with a health education program in older adults with knee osteoarthritis. The Fitness Arthritis and Seniors Trial (FAST) [see comments]. JAMA 277:25–31, . (1997) Effects of self-care education on the health status of inner-city patients with osteoarthritis of the knee [see comments]. Arthritis Rheum 40:1466–1474, . (1989) Can the provision of information to patients with osteoarthritis improve functional status? A randomized, controlled trial. Arthritis Rheum 32:1577–1583, . (1983) The evaluation of acetaminophen in the management of osteoarthritis of the knee. Current Therapeutic Research 34:59–66, . (1992) Treatment of knee osteoarthritis: relationship of clinical features of joint inflammation to the response to a nonsteroidal antiinflammatory drug or pure analgesic. J Rheumatol 19:1950–1954, . (1993) Comparison of naproxen and acetaminophen in a two-year study of treatment of osteoarthritis of the knee [see comments]. Arthritis Rheum 36:1196–1206, . (1997) Local NSAID gel (eltenac) in the treatment of osteoarthritis of the knee. A double blind study comparing eltenac with oral diclofenac and placebo gel. Scand J Rheumatol 26:287–292, . (1980) Intra-articular steroids in osteoarthritis. Rheumatol Rehabil 19:212–217, . (1995) Intra-articular triamcinolone hexacetonide in knee osteoarthritis: factors influencing the clinical response. Ann Rheum Dis 54:379–381, . (1996) Intra-articular corticosteroids are effective in osteoarthritis but there are no clinical predictors of response. Ann Rheum Dis 55:829–832, . (1997) Arthroscopic evaluation of potential structure modifying activity of hyaluronan (Hyalgan) in osteoarthritis of the knee. Osteoarthritis Cartilage 5:153–160, . (1995) The effects of intra-articular administration of hyaluronic acid on osteoarthritis of the knee: A clinical study with immunological and biochemical evaluations. Eur J Rheumatol Inflamm 15:47–56, . (1995) The safety and efficacy of different dose schedules of hyaluronic acid in the treatment of painful osteoarthritis of the knee with joint effusion. Eur J Rheumatol Inflamm 15:25–31, . (1998) Efficacy and tolerability of oral chondroitin sulphate as a symptomatic slow-acting drug for osteoarthritis (SYSADOA) in the treatment of knee osteoarthritis. Osteoarthritis Cartilage 6(suppl) 31–36, . (1998) Effects of oral chondroitin sulphate on the progression of knee osteoarthritis: A pilot study. Osteoarthritis Cartilage 6(suppl) 39–46, . (1998) Efficacy and tolerability of chrondroitin sulphate 1200 mg/day vs chondroitin sulphate 3 × 400 mg/day vs placebo. Osteoarthritis Cartilage 6(suppl) 25–30, . (1996) Comparison of the antiinflammatory efficacy of chondroitin sulphate and diclofenac sodium in patients with knee osteoarthritis. J Rheumatol 23:1385–1391, . (1980) Double-blind clinical evaluation of oral glucosamine sulphate in the basic treatment of osteoarthrosis. Curr Med Res Opin 7:110–114, . (1994) Glucosamine sulphate in osteoarthritis of the knee. Osteoarthritis Cartilage 2:51–59, . (1994) Glucosamine sulphate compared to ibuprofen in osteoarthritis of the knee. Osteoarthritis Cartilage 2:61–69, . (1989) A single-blind, placebo-controlled study of glycosaminoglycan-peptide complex (‘Rumalon’) in patients with osteoarthritis of the hip or knee. Curr Med Res Opin 11:366–373, . (1995) Glycosaminoglycan polysulfuric acid (GAGPS) in osteoarthritis of the knee. Osteoarthritis Cartilage 3:15–23, . (1996) Patient education interventions in osteoarthritis and rheumatoid arthritis: a meta-analytic comparison with nonsteroidal antiinflammatory drug treatment. Arthritis Care Research 9:292–301, . (1990) Pain coping skills training in the management of osteoarthritic knee pain: a comparative study. Behavior Therapy 21:49–62, . (1990) Pain coping skills training in the management of osteoarthritic knee pain-II: follow-up results. Behavior Therapy 21:435–447, . (1996) Spouse-assisted coping skills training in the management of osteoarthritic knee pain. Arthritis Care Research 9:279–291, . (1992) Supervised fitness walking in patients with osteoarthritis of the knee. A randomized, controlled trial [see comments]. Ann Intern Med 116:529–534, . (1991) Treatment of osteoarthritis of the knee with heel wedges. Int Orthop 15:31–33, . (1981) Weight reduction in osteoarthritis using phentermine. Practitioner 225:231–232, . (1992) Weight loss reduces the risk for symptomatic knee osteoarthritis in women. The Framingham Study [see comments]. Ann Intern Med 116:535–539, . (1996) Effects of muscle-strength training on the functional status of patients with osteoarthritis of the knee joint. Nurs Res 45:68–72, . (1998) The effects of a physical training program on patients with osteoarthritis of the knees. Arch Phys Med Rehabil 79:1421–1427, . (1994) The Swedish knee arthroplasty register. A nationwide study of 30,003 knees 1976–1992. Acta Orthop Scand 65:375–386, . (1990) Clinical practice guidelines: directions for a new program. (National Academy Press, Washington DC) . (1999) Clinical guidelines: potential benefits, limitations, and harms of clinical guidelines. BMJ 318:527–530, . (1999) The hazards of scoring the quality of clinical trials for meta-analysis [see comments]. JAMA 282:1054–1060, . (1998) Design of clinical trials in knee osteoarthritis: practical issues for debate. Osteoarthritis Cart 6:371–373, .